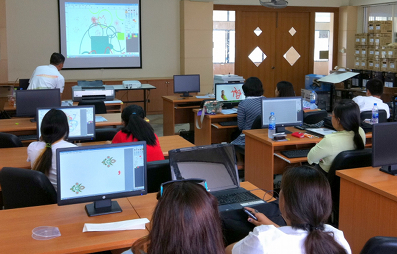 We are honored that Rajamangala University of Technology Rattanakosin from Salaya, Thailand has chosen Arahne software. Rajamangala University of Technology Rattanakosin (RMUTR) was established in 2005 as one of nine universities named Rajamangala University of Technology (RMUT). Students have had an intensive course of Arahne software by Arahne engineer Mr. Anton Gregorčič and Arahne agent from Thailand Mr. Vichai Tantikunakonrat. During the four days course students have shown great interest in designing fabrics with Arahne software.